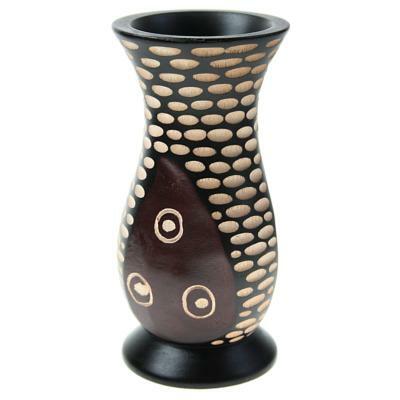 Our beautiful handmade Thai vases are a masterful piece of home decor. The gorgeous grain of the sustainably sourced mango wood matches the cool geometric designs perfectly. The vases are not water tight so we recommend using dried flowers only making them perfect for people who love flowers but suffer from allergies or people who wish they were able to care for flowers and plants but can't. Our vases allow you to tap into your floristry skills and arrange your own artificial bouquet to enjoy all year round! Sales of our Thai wooden vases help the small family run business provide financial support and security to its small team of staff in an area that suffers from unemployment.